Do you remember the way the JNU commie snake Omar Khalid who asked for destruction of India and was burning Manu Smiriti and opposed Durga Puja, because these Hindu festivals represent superstition and patriarchy? 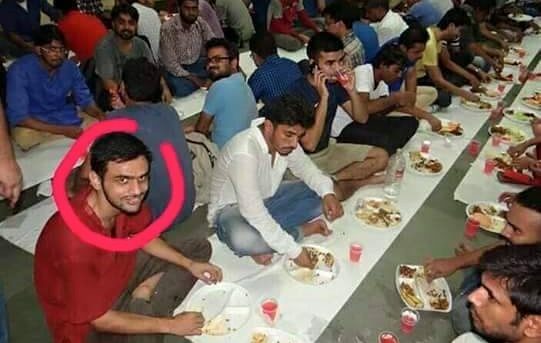 The same Marxist Jihadi was recently seen dining at an Iftar party. He is a perfect representation of the Jihadi/Communist Rationalist of Great intellectual wankland i.e. JNU. This open celebration of Iftar while opposing Durga Puja in the campus very well shows what these supposed rationalists of the communist/naxal heartland are on the inside. The guy is the typical example of the rabid Jihadi masquerading as a rational secularist, and is being provided ample cover by the leftists in media to carry on atrocities against Hindus. This Jihadi and his dad eloquently shout against patriarchy, accompanied by their mother in an Arabian black tent. Apparently covering up his mother from head to toe is what defines fight against patriarchy. Shows how pathetic Islam and the leftist/feminist academic trash in Bharat are. What can one expect from a supposedly secular/godless communist party of Bharat, which hosts and drinks and dines Iftar parties for the most barbaric religion of the world- Islam? Hindus should never miss these opportunities to expose such Jihadi snakes for what they are. This is why the only way to save India and indeed the world is by eradicating the Jihadi ideology without playing the dumb game of defining moderate vs extremists snakes. Just like a snake cannot relinquish his poison, similarly a Muslim cannot give up his dream of world Ummah. So Hindus should not fall for the drama when Islamists like Omar Khalid cover their hatred for Hindus by masquerading as secular leftists. Why Surajit Dasgupta is wrong on Owaisi?